Attorney General Rob McKenna spoke to us about the serious challenges he sees for the state of Washington and his proposals to fix them if he is elected governor. The House Band – Paul Chapman, John DeWater, and Andrew Face were honored as Rotarians of the month. Stephen Brown, Trustee of the Rotary Foundation, spoke to us about its’ successes and upcoming challenges. Madeline Gauthier reminded us that the Adoption Part will be held on October 20th and more volunteers are needed. High Unemployment. He noted that when you add in those who have stopped looking for work or drawing unemployment, Washington has the 7th highest rate of unemployment in the country. Expensive State to do Business in. Lack of Qualified Employees in Certain Industries. Underfunding of Public Schools. McKenna noted that the state is now under a court order to fund public education. Higher Education is in Trouble Due to Lack of Funding. I. Reduce the high cost of doing business in the state. Attorney General McKenna would like to open unemployment insurance, which is one of the most expensive in the country, to competition. He said that Washington pays 80% more than the mean among states. He would also like to lessen the burden of the B&O tax by having a higher deductable and making reporting and payment of taxes easier. He would also like to reduce and reform the amount of regulations with which businesses must comply. II. Increase the education of the work force. 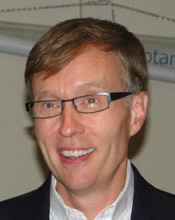 Attorney General McKenna stated that there are too few programs to train skilled workers, noting that many aerospace workers will be retiring in the next few years. He wants to restore the percentage of the state budget that goes to public education to levels that it used to receive. He wants to reform the education system to reward teachers for good teaching, not longevity. Finally, he wants to restore funding of higher education, not just at the main state campuses but at branches and community colleges which are generally more cost effective. The money for these costs, he states, can come from predicted increased tax revenues and efficiencies in state government. III. Reform State Government. Attorney General McKenna would like to shrink the number of state employees through attrition. He stated that in his office he has 14% less employees than last year but the remaining employees are more efficient and morale is high. He would also like to open some government projects to open competitive bidding. He says this has worked in several other states to reduce costs. He stated that the state departments usually get the work but learn from the bids of private businesses how to be more effective. Finally he stated that there should be reductions in health care insurance costs which have skyrocketed in recent years. The Attorney General had time for a few questions. He stated that he thinks private business is the place to create innovation, not in a public department. He says he is getting the details of his program out to the public in debates, and social media sources and through editorial boards of news media. He would also continue to push, as the current administration has, to get the federal government to allow more flexibility in the Medicaid program. President Chris called the meeting to order in a timely fashion aided by a few bars of Good Day Sunshine by the Beatles, just after a beautiful double rainbow graced the morning sky. Tom Smith delivered the Invocation and the Pledge of Allegiance while Steve Peters gave a general greeting to all visiting Rotarians and guests, since the agenda (as well as the hall) was packed. Getting back to the regular program, President Monger presented Rotarian of the Month awards to the BBRC In House Band: John DeWater, Andrew Face, and Paul Chapman. Thanks to the work of Jim Zidar, Kim Shrader and Jeff Cashman, a new Roll of Honor banner has been created to be shown at BBRC meetings, with the names and degrees of giving by BBRC members to the Rotary Foundation. Kim Shrader gave a little quiz, the answers to which were easily provided by the audience: EREY of course means Every Rotarian Every Year contributes to the Foundation at at least the recommended amount of $100 to be a Paul Harris Sustaining Member. The average yearly gift of BBRC members is $320. introduced by BBRC’s Steve Lingenbrink, our District Governor. Stephen spoke about the Rotary Foundation’s Future Vision Committee. He said that the Foundation’s matching grant program was so popular that there needed to be some changes to the grant structure. One hundred districts have been involved in a pilot project which now provides two types of grants, District Grants and Global Grants. 1. Adoption Party reminder. Madeline Gauthier is looking for help in specific areas for the Adoption Party, which will be held on October 20 at Woodridge Elementary School, 12619 SE 20th Pl, Bellevue. She needs Drivers, Table Decorators, Signage Deliverers, Basketball Supervisors, a Face Painter, a Supply Captain, Game Table Hosts, and Sign Up Table Hosts. She also needs to borrow a ping pong table. Please contact Madeline if you can help. 3. BBRC Oktoberfest at Lawrence the Florist on October 6. Robert Orben: Do you ever get the feeling that the only reason we have elections is to find out if the polls were right?